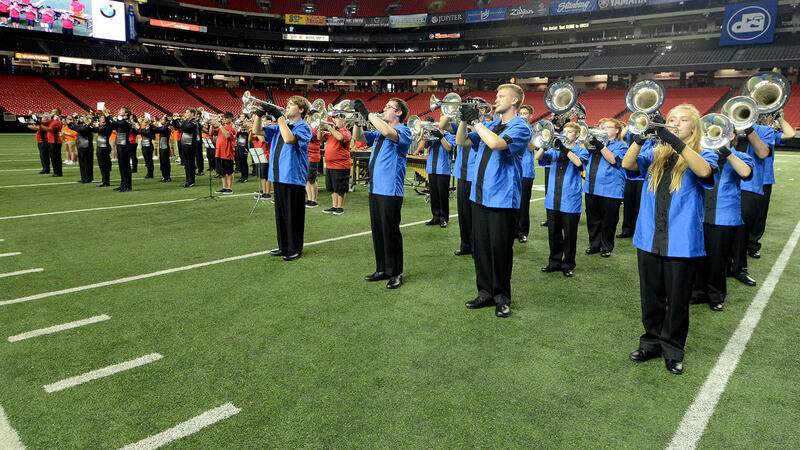 Prior to the DCI Southeastern Championship in Atlanta, SoundSport held its largest competition to date as part of the 2015 DCI Tour. Five groups from across the region gathered at the Georgia Dome on Saturday morning; some new to the venue, some returning for a second time. The performing teams came from a multitude of backgrounds, including college bands, former Drum Corps Associates all-age ensembles, and community organizations. Introduced alongside DrumLine Battle in 2013, SoundSport provides an opportunity for groups of any age and any instrumentation to perform. Often coinciding with DCI Tour events, SoundSport can and has served as a launch pad for up-and-coming groups. Solaris, the first group to perform on Saturday, includes many members from a former Drum Corps Associates group. “We still wanted to perform, so we figured with SoundSport, we were able to still let the members express their musical abilities and express their performance abilities,” Solaris drum major Caroline Scott said. The Rocketeers, who also performed on Saturday, joined SoundSport for similar reasons, and has already seen a marked increase in interest from their community. Many of the groups that performed on Saturday spanned several age groups, and that is viewed an advantage, not a detriment. Scott has seen similar growth in her team. Sonus Brass Theater took the award for overall Best of Show, mainly due to their entertaining show that kept the audience engaged. “Although technical excellence is important, there’s a heavy emphasis on crowd engagement and entertainment on the SoundSport judging sheets,” SoundSport co-founder John DeNovi said. The next major SoundSport competition in conjunction with the 2015 DCI Tour will take place on Saturday, August 8, as part of the DCI World Championships in Indianapolis.